Greenies Dog Dental Treats - Petite - 45/pk. 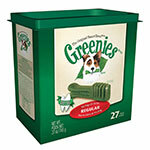 Pamper your dog with Greenies Dog Dental Treats. Not only does this treat deliver a taste dogs love, but the unique teeth-cleaning shape is clinically proven to help clean teeth by reducing tartar and plaque buildup, while also freshening their breath! Pamper your dog with Greenies Dog Dental Treats. Not only does this treat deliver a taste dogs love, but the unique teeth-cleaning shape is clinically proven to help clean teeth by reducing tartar and plaque buildup, while also freshening their breath! Sold by one 45/pk of dental treats for Dogs. Chewy texture that helps clean teeth.